Keep it safe , prevent it from falling and dropping. Do not place heavy objects on the camera. Keep the camera away any strong electromagnetic interference (such as motor), in order to avoid strong radio waves damage products and affect the quality of sound or image. Don't expose the product directly to high temperatures over 55°C. The Wi-Fi App lets you control your camera remotely using a smart phone or tablet. Features include full camera control,live preview,playback and sharing of selected content and more. 1.Download the LIVE DV App or to your smart phone or tablet from the Google Play or Apple App Store. 2.Press the Power Button for seconds to power the camera ON. 3.Press the Wi-Fi Button to turn on the camera's Wi-Fi. 4.connect to the network called "Live DV"In your smart phone or tablet's Wi-Fi setting,. 6.Open the LIVE DV App on your smart phone or tablet. 7.The camera's screen will turn black, then you can preview from your phone's screen. Press the Wi-Fi Button again to turn off the Wi-Fi. Professional EIS 4K Action Camera: 4K / 30FPS,EIS 4K/ 30FPS,EIS 2.7K / 30FPS,EIS 1080P / 60FPS,EIS 1080P / 30FPS,EIS 720P/60FPS and EIS 720P / 120FPS video and 20MP photo resolution created by Sony Sensor,170 degree ultra wide angel 6G fish eye lens and 6 axis EIS so provides smooth and stable HD video without distortion and clearer. Accurately capture every epic view and exciting moment for you. Dual 1200mAh Batteries: CrazyFire EIS sport action camera come with 2 rechargeable 1200mAh batteries, the power of each battery is 15% more than other brands' 1050mAh battery, 30% more than other brands' 900mAh battery. Each of our battery can record up to 105 minutes, So no more worry about the recording time for this HD action camera. External microphone & 139ft Waterproof: The external microphone make the sound absorption effect more perfect,fuselage self-contained noise reduction mode, high fidelity sound sound quality,greatly improve the outdoor audio recording effect. 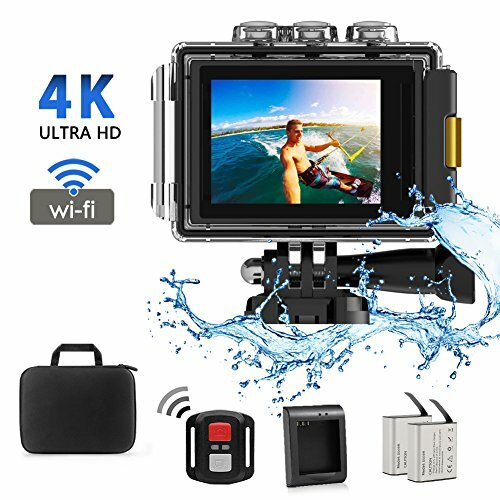 139ft(40m) waterproof camera, CrazyFire CR101 mini action camera equipped with durable IP68 waterproof case water sports, with some common free accessories, suitable for all kinds of indoor and outdoor activities. Built-in Wifi & 2.4G Remote Control: Share or edit videos and images easily. Download the free app (Live DV) on your smart phone or tablet to take full control of the camera in real time. HDMI, USB and AV video output are available for connecting computers, TVs and projectors.Put the remote control on your wrist while installing the sports camera on your helmet, convenient to record moments in places you can't reach. Wireless range up to 10m(33ft), the remote is not waterproof. Versatile But Compact: This 4k sports action camera features multiple functions including driving mode, image rotation, time-lapse, loop recording, slow motion, dramashot, exposure and white balance. Bringing this sports camera to more applicable conditions beyond your expectation. Ideal for water sports such as swimming, surfing, diving, etc. If you have any questions about this product by CrazyFire, contact us by completing and submitting the form below. If you are looking for a specif part number, please include it with your message.